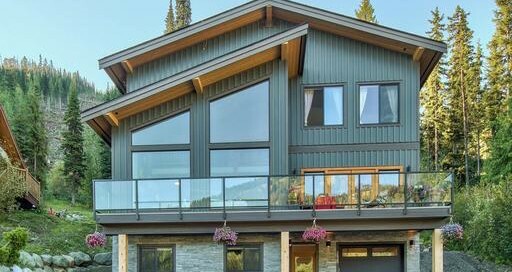 This timber frame home features an airy and spacious floor plan with a large and open-concept living, dining and kitchen on the main floor that lead to a covered deck that’s perfect for entertaining or simple enjoying the view. The master suite with full ensuite bathroom and walk-in closet as well as a two car garage also make up the main floor. Downstairs there are two more bedrooms, a bunk room, two bathrooms and large rec room with bar. 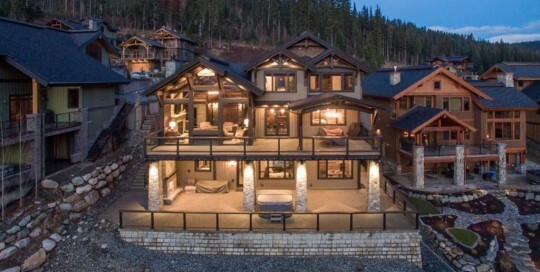 This modern timber frame home located in the mountains of Sun Peaks, B.C. features an open-concept kitchen, dining and great room that leaders to a large deck with plenty of room for relaxing and entertaining. Upstairs in an open loft area and the basement features a self-contained suite with one bedroom and one bathroom. 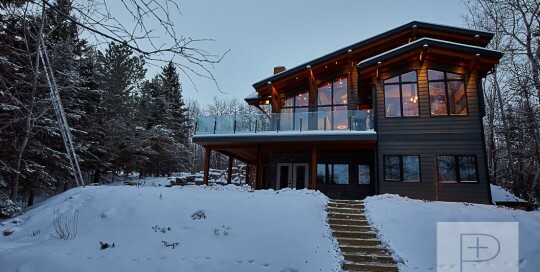 This open-concept timber frame home features a large and airy main floor that boasts kitchen, dining and living area with vaulted ceilings, large walk-in pantry, mud and laundry room, bathroom and a private master suite. Upstairs is a loft area with another bathroom and two more bedrooms. Other features of this home include a two car garage and large shop with another garage door entrance at the back of the home as well as a large games room and extra room that was turned into a dream playroom in this home. 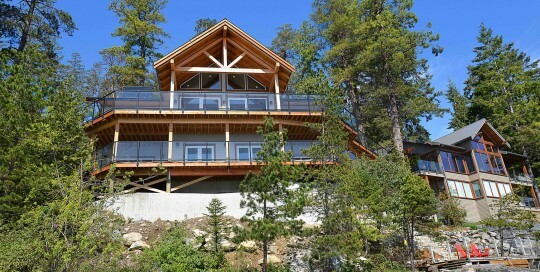 This timber frame log home has a hybrid style and was designed with efficiency in mind for both the retired couple and the environment. All the living spaces including an open-concept kitchen and living area have been incorporated into the main level to provide ease of accessibility. 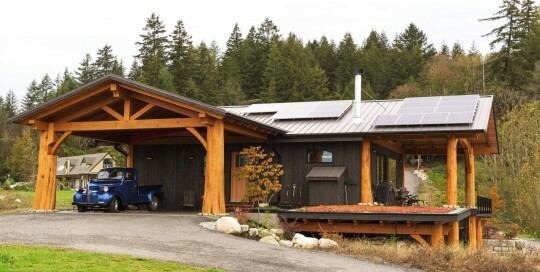 The exterior of this home not only features a large, covered deck for entertaining and relaxing, but also has two green roofs and solar panels to produce enough energy to fulfill this home’s needs year round. 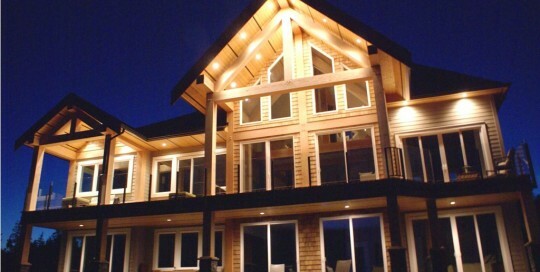 This elegant three story timber frame log home is a great family home for year round living. This home features a bedroom and full bathroom on each floor with a very private master suite with ensuite and walk-in closet on the top floor loft. In the basement is a rec room, bunk or office room and outdoor hot tub. On the main floor is an open concept kitchen, living and dining space as well as a spacious two car garage with room to work. 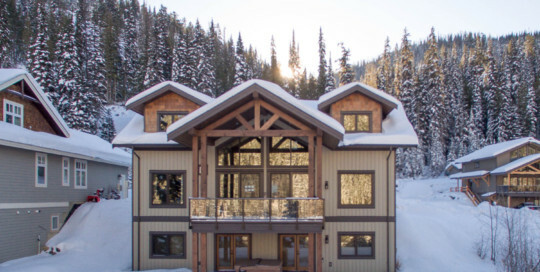 This expansive timber frame home is the perfect home for living mountain-side all year round with a ski room for all your gear and a hot tub to warm up in. A large, covered deck and patio space along with an exterior fireplace give ample opportunity to relax and entertain outdoors in the warmer season. 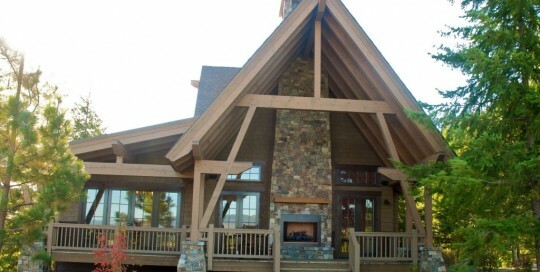 This timber frame log home is great for entertaining guests both indoors and outdoors. On the main floor is a kitchen with large island that can seat seven as well as a dining area that seats up to eight more. Outside, the wrap-around deck with outdoor fireplace also offers ample entertaining space. 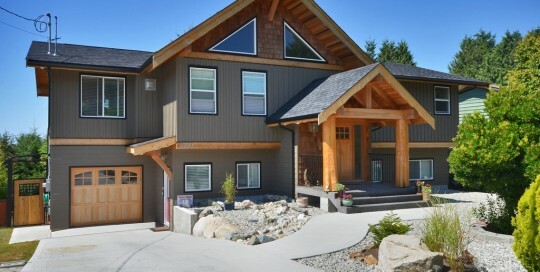 This spacious timber frame log home is always filled with natural light from the floor to ceiling windows in both the living room and master bedroom as well as ceiling height windows in the kitchen. A mini bar inside and wrap-around deck outside are perfect for entertaining and relaxing. 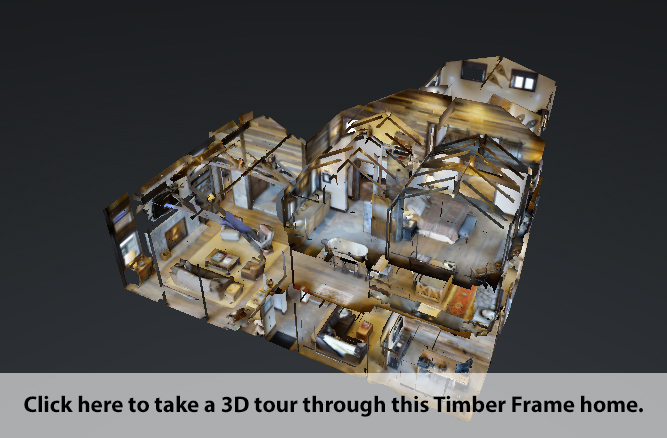 This custom timber frame log home (also known as Tamaric) has everything you would expect and want in a luxury home. The grand living, dining and kitchen area looks out through folding glass windows and walls to a wrap-around covered patio complete with outdoor kitchen and fireplace. 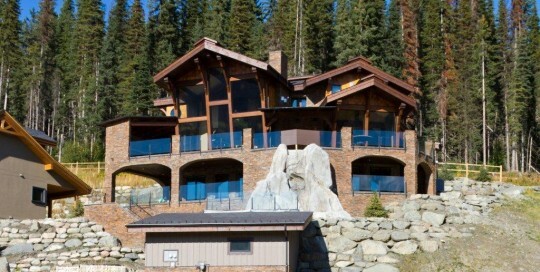 Other luxurious details include a raised eating bar in the kitchen and a full bar and exterior shower in the basement. Scope of Work: This project is an exemplary example of our value engineering capabilities. This production home was originally designed and engineered by others and the developer came to us to re-design and value engineer this production model. Improved finish quality, including higher material grade. 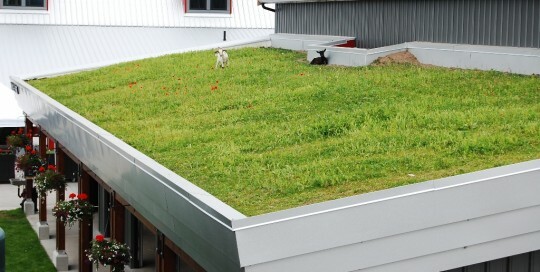 Green roof and living wall components supplied and installed by Streamline Design. All our projects are pre-vegetated in a local green house to ensure maturity and longevity with low maintenance requirements. Green Roof and Living Walls are great for the environment, providing biodiversity, rain water collection, evapotranspiration (cooling effect) as well as many other benefits. 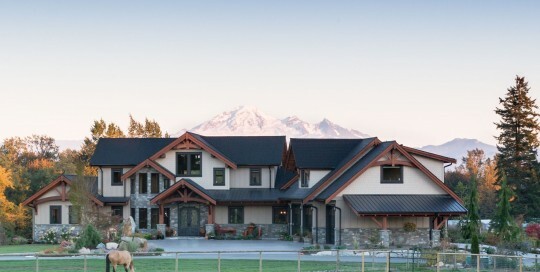 Packed with unique features, this timber frame log home design is not only luxurious, but energy efficient too. Solar panels adorn the roof with copper details, while a glass catwalk floor, free floating timber stairs, floor to ceiling windows and a three sided fireplace show off the luxury touches inside. Head outside to the deck and relax in the custom, sunken hot tub or enjoy the warmth from the outdoor fireplace. 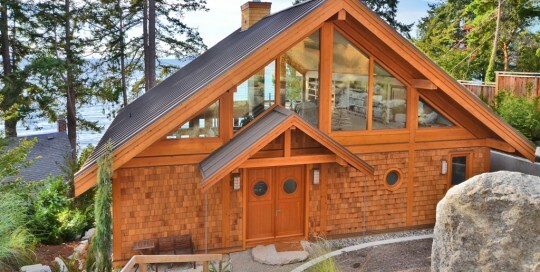 Unique Features: Douglas fir timber frame, Free floating/suspended timber stairs, Custom prow glazing details with minimal window trim, two outward sloping prows (at 10 degrees) to maximize the view and curb appeal, curved timber beam, glass catwalk/floor, windows in the fireplace, arch top doors, porthole windows to access/frame peakaboo views, exterior waterfall feature. 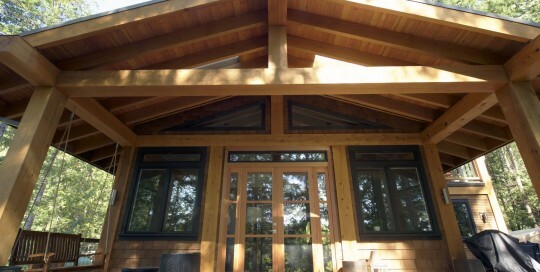 We currently don’t have a detailed description for this timber frame portfolio. If you would like more details please contact us info@streamlinedesign.ca. 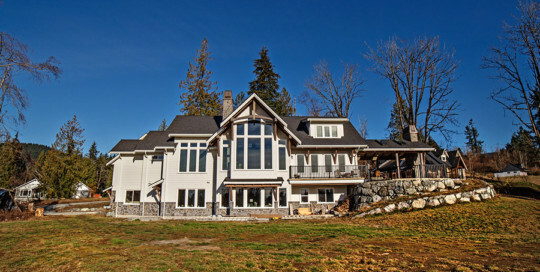 This timber frame log home design features a large deck on the main floor and covered patio in the basement for relaxing outdoors and enjoying the view. Floor to ceiling windows in the great room allow lots of natural light in and a two way statement fireplace keeps the space cozy and warm. 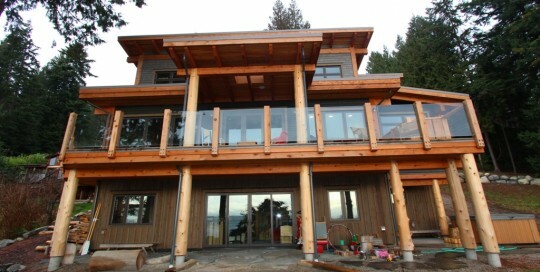 Take a tour through this beautiful oceanside timber frame home located on the west coast of B.C. 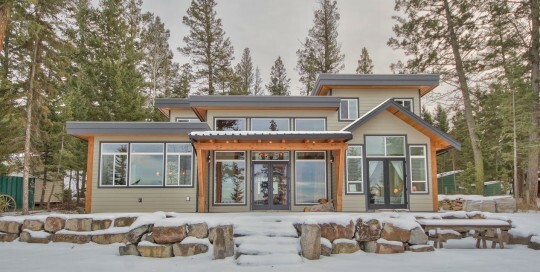 This simple and open concept timber frame log home design with a single gable roof line features a total of seven french doors that not only allow ample natural light in, but open each indoor living space to the outside, creating an outdoor living experience like no other. The great room and master suite share a double sided gas fireplace while the master ensuite includes luxuries such as a custom shower with a glass wall and cedar bench and a soaker tub that hangs out over the building’s edge. Location: Davis Bay, Sechelt BC. 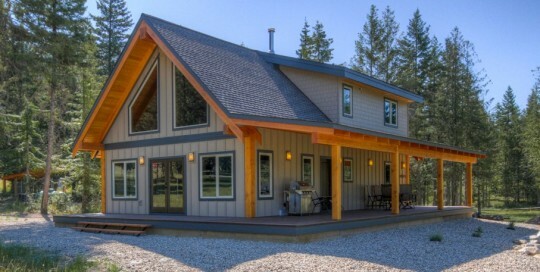 This timber frame log home design feels cozy and has an efficient layout. The open kitchen, living and dining area is bright and flooded with natural light with large windows and french doors leading out to a partially covered deck. Relax in the soaker tub of the master ensuite upstairs or the over-sized couches in the rec room downstairs. 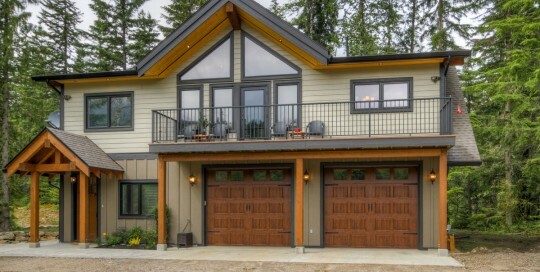 Size: Garage and shop 1144 sq ft; Living area above 1071 sq ft.
2013 Gold Keystone Award for ‘Best single family detached home under 1,500 sq.ft.’ The Keystone awards celebrate excellence in the Home Building Industry in the Thompson-Nicola Region. Presented by the Canadian Home Builders Association. 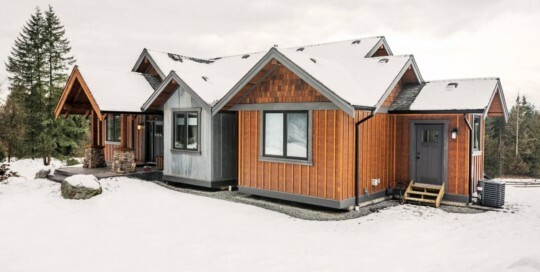 Perfect for retirement or a small family, this timber frame log home design features three bedrooms, two upstairs and the master downstairs with ensuite and walk-in closet. The open concept kitchen, dining and living area are bright and spacious with floor to ceiling windows and french doors leading out to the wrap around deck and covered porch. Scope of Work: Architectural and Structural. This small retirement home is a great example of what you can achieve on a small budget… If you have realistic expectations. 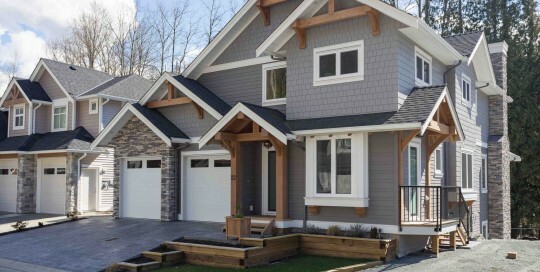 2013 Silver Keystone Award for ‘Best single family detached home between 1,500 – 1,999 sq.ft.’ The Keystone awards celebrate excellence in the Home Building Industry in the Thompson-Nicola Region. Presented by the Canadian Home Builders Association.